I’ve been wanting to try baking with bacon for a while. Salty and sweet is a classic combo; there is caramel with fleur de sel, pretzels dipped in chocolate, etc. My local cupcake bakery Let Them Eat Cake! beat me to it by making “Fat Face Bacon” (named for the sandwich shop next door): a dark chocolate cupcake with bacon pieces, topped with chocolate buttercream and more applewood bacon pieces sprinkled on top. I went in first thing to scoop up a couple to bring home. They were pretty good, but not quite what I was looking for – I think I would add a bit of salt to the buttercream, or maybe sprinkle the top with fleur del sel. The buttercream was also a bit too thick for my taste and the pieces of bacon in the cake gave it a strange texture (it felt like eating paper). Usually I love all the cupcakes from this bakery, so maybe this just isn’t the flavor combo for me. I wonder if there’s some way to incorporate bacon flavor into cake or frosting other than just putting pieces of bacon into them. Bacon extract? (Ew, that just doesn’t sound right). I think I will try my hand at some baked good using bacon sometime soon. Any ideas? However, I also picked up one of my favorites at the bakery too, a special Saturday flavor called “Cookie Monster.” These are amazing cupcakes stuffed with cookie dough and topped with perfectly creamy cookie dough buttercream and mini chocolate chips. One of the best cupcakes I’ve ever had. You could have hard shards of caramel with bacon (or the same coarsely ground) on top of the cream and layered inside the cupcake batter. Interesting idea! I saw a pie that used bacon peanut brittle as garnish. Bacon caramel sounds even better. You could use Bacon Salt! Baconsalt.com. Or maybe .commmmmmmmmmmm. I’ve heard of that stuff! I wonder what’s actually in it – do you have some? maybe use bacon drippings as part of the fat content in the batter/icing? Good idea! It sounds sort of gross and yet so appealing at the same time. I’ll admit I’d be tempted to use 3/4 butter in the mix and try a little bacon fat- that way you get a bit of that salty bacon taste without the weird texture inside. I think that plus the caramel/bacon suggestion above might work. I’ll let you know once I try! Hm…maybe that bacon-flavored vodka could be another way to get the bacony goodness in there…and make the cupcakes more “adult” too!! Wow. I’ve never heard of bacon vodka! Have you ever tasted it? I can’t quite imagine that…but now I’m curious! No…I’ve not personally tasted it, but I know people who’ve tried it and found it to be really bacony!! Weird and cool! Thanks for sharing. Someday I will have to find this stuff and try it! I’ve had a straight shot of bacon vodka. I thought it was pretty nasty, but others have assured me that it’s great in Bloody Marys (but I don’t like tomato juice, so I haven’t tried that). Love the salty-sweet combo! 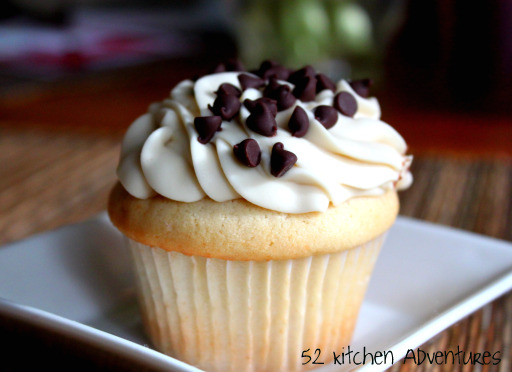 I just blogged about salted caramel sauce, and now I’m craving these cupcakes! Ooh I looked at your caramel sauce recipe – that looks delicious! Salty and sweet = so good. I’m wondering if you could use rendered bacon fat in the cupcake batter to amp up the bacon flavor without just using bacon bits? Bet that might be tasty, indeed. Yes, I think that I’ll definitely do! Plus 1 or 2 of these other suggestions. It will be an interesting experiment, I’ll let everyone know how it goes! I have always wanted to try that… but am not brave enough!! You SOOOOO need to make it with your suggestions! I’m on it Amanda! I’m going on vacation next week, but after that it’s on my to-do list. I’ll incorporate as many suggestions as I can! What an interest recipe using bacon but not sure if it would work on a sweet cake or not? But if you put it in a muffin with cheese and herbs … now that would be something. That would be interesting. You could definitely make frittatas in a muffin tin with bacon. I think the point of doing a sweet cake like chocolate is making a sweet and salty combo, but it wasn’t quite right in this case. 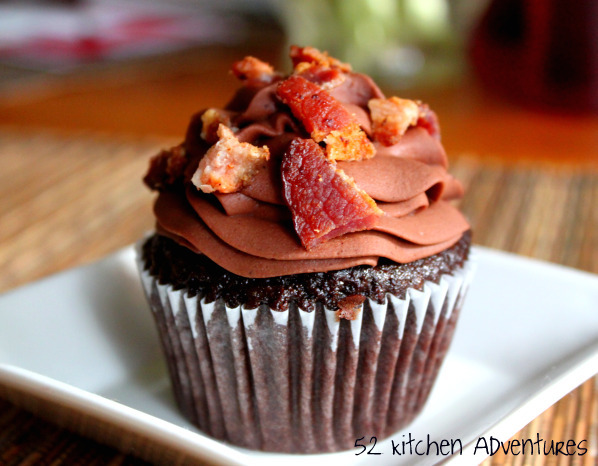 I had posted a Dark Chocolate Bacon cupcake recipe awhile ago and really liked the outcome. I was surprised it wasn’t as salt/sweet as you’d expect. Good idea on sprinkling the frosting with fleur de sel or salt. I’ll have to try that next time. I’d try different brands of bacon. Learned this from adding bacon to mac and cheese. Some cook up too meaty and stiff to work well in crumbled or minced form. A thinner slice that cooks up more papery and crisp might work better in a cupcake. Great tip Suz! That makes a lot of sense but I didn’t even think about it. Bacon and chocolate sounds like an awesome and fun combination. Super cool. I’m making Swedish cupcakes in the next episode of my cooking show, please check it out. I think you would like it! I checked out your channel – that’s awesome Linn! I always learn best by seeing something done, so I love videos.